The stadium during demolition works. A bid to build almost 50 houses on what was Kettering Town FC’s home for more than 100 years is set to be approved. Harpur Developments applied to turn the now-demolished Rockingham Road stadium into housing in July last year. The stadium five years before the Poppies left. The 49-home development, a mix of two, three and four-bed houses with 14 ‘affordable’ homes, is recommended for approval by planners ahead of a council meeting on Wednesday (February 20). Access to the site, which has been vacant since the Poppies left in 2011, would be from the existing Rockingham Road mini-roundabout. If approved there would be Section 106 agreements worth about £11,000 per house including funds towards education, North Park improvements, a new Rockingham Road highway crossing and a libraries contribution. A report set to be discussed by councillors said there was no reason to refuse the plans, which had nine objections. The stadium from the air prior to demolition. It said: “The proposal would offer a number of social, environmental and economic benefits. “These include the redevelopment of a brownfield site and provision of 49 homes in a sustainable location which will help to deliver the council’s five year housing land supply, direct and indirect jobs and increased local spend by future occupiers, Section 106 and council tax contributions. The Rockingham Road stadium, which was the Poppies’ home from 1897 to 2011, had been the subject of a long-standing feud between supporters of the club and the council. The club hasn’t played in the town since 2011 and currently play in Burton Latimer, but a few years ago some fans harboured hopes of returning to their old stomping ground. Before it was demolished Poppies fans tried to get the stadium listed as an asset of community value, which would have given them the opportunity to match bidders. The application was rejected by the authority and fans marched on council offices to voice their anger before a second bid was rejected. In September 2017 the stadium was bought by developers and the demolition began fewer than two months later. But fans’ hopes of returning back to the town were given a huge boost, and tensions eased, in September last year after the club reached an agreement with the council to buy a piece of land off Scott Road for a new home. Campaigner Richard Atkinson said that while they didn’t save their old ground their campaign forced the council and club to talk. He said: “The final nail for the stadium really was when it was bulldozed, but the campaign itself will only finish when the first match is played at the new ground. “Whilst the petition and march didn’t save the stadium they achieved their real aim in forcing both the club and the council to realise the passion there is for Kettering Town Football Club to return to the town. He added that supporters are ‘ready to do their bit’ to help get them back playing football in Kettering. He said: “The announcement last September that the land at Frenches Field would be made available for a new stadium was fantastic news for everybody. “We realise there is an awful long way to go, but the supporters are all ready to do their bit - as shown by the Tin Hat Fund which the trust are currently running to raise the money to build a new terrace at Latimer Park. “The terrace will not only improve the match day experience at our current home, but will be able to be moved to form part of the new stadium when the time comes. 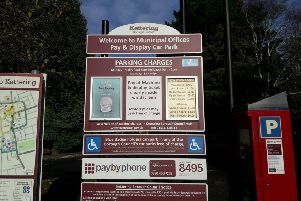 Campaigner and independent councillor Michael Brown said: “I’m glad we have succeeded in putting the pressure on the council for some Section 106 money towards local community sports after some initial resistance, but it really should have been towards a new stadium for Kettering.